ACCORDING to a rough estimate there must be about 300,000 gallons of ginger-beer sold per annum in the streets and immediate neighbourhood of London. This summer beverage, therefore, represents an important trade, and it has the further advantage of giving employment to a number of indigent persons who would otherwise, probably, fall on the rates. The trade requires but little capital, no skill, and scarcely any knowledge. A pound or thirty shillings would suffice to start a man or woman in this business, and a recipe for the brewing of ginger-beer is easily obtained. The difficulty, if any, consists of boiling the ginger in the large volume of water employed. For instance, three pounds of ginger are generally used for nine gallons of water, and will make altogether a gross of ginger-beer. The poor who make ginger-beer do not, however, possess stew-pans that will hold nine gallons; and, therefore, do not scruple to resort to the copper. This disgusting habit of boiling ginger in the same vessel which serves for washing the dirty linen of several families is, I fear, extensively practised, nor is it thought in any way derogatory to the value and popularity of the drink. The ginger-beer seller who initiated me into this mystery acknowledged that he used the copper in his house, after the other lodgers had finished washing and boiling their clothes, and did not for a moment anticipate that I should take exception to such a practice. When the strength of the ginger has been extracted by boiling, a little lemon acid, some essence of cloves, loaf sugar, and yeast have to be added. The mixture can then be bottled, and should be left to stand twenty-four hours. If, however, the stock has suddenly fallen short, either through excessive demand, resulting from the sudden advent of hot weather, or in consequence of the small supply of bottles possessed by dealers whose capital is very limited, a larger quantity of yeast will produce effervescence much sooner. Further, to add to the sharpness which should result from the essence of lemon, some makers do not hesitate to employ a little oil of vitriol so that, after all, it is problematical whether the strict temperance advocate who remains faithful, even during the dog-days, to ginger-beer and lemonade, does not run as much risk of poisoning himself as the frequenters of public-houses. The various forms of lemonade, which are so often preferred to ginger-beer, present the same dangers, and may at times be productive of considerable mischief. The present generation of street vendors have had, however, to compete against the great wholesale manufacturers, who employ the powerful aid of steam. The soda- water, lemonade, &c., produced in these large factories has at least the advantage of being clean, though often impregnated with lead. A most experienced ginger-beer maker, a man who had served in the Indian army, and was accustomed to brew for his entire regiment, explained to me how he lost one of his best customers. He sold to a public-house keeper near London Bridge, about half-a-gross per week. On one occasion, while delivering his usual supply to the publican, there happened to be four gentlemen drinking ginger-beer at the bar, who noticed him. On leaving the public-house, these gentlemen passed by the barrow, on which his glasses and bottles were laid out to attract pedestrians. They had just paid fourpence a glass for the ginger-beer they had seen this man deliver over to the publican; and on tasting what he sold in the street for a penny, discovered it was precisely the same brew. Every one knows, who reflects on the subject, that the ginger-beer publicans sell for fourpence is not worth a halfpenny a bottle; but when these extortionate charges are rendered so apparent to the victims, they are apt to produce an irritating effect. Hence the gentlemen in question returned to the public-house, expressed their discontent in terms more forcible than elegant, and the publican was not a little disconcerted when it was conclusively proved before his assembled customers, that he realized more than three hundred per cent. on the sale of ginger-beer-selling bottles at fourpence which he had bought from a poor man for three farthings! This demonstration produced, however, a disastrous effect, so far as the ginger-beer seller was concerned. The publican, in a fury, not only refused to buy any more beer from him, but would not even return his empty bottles. The ginger-beer man was therefore compelled to take out a summons to recover his empty bottles, but I am pleased to add that the magistrate expressed his sentiments in strong terms, and compelled the publican to pay compensation for the time the ginger-beer seller had lost. Thus this publican ceased to patronize the street vendor, and, like the other members of his trade, ordered his supplies from the wholesale manufacturers, where he obtains the beer at the same price, if not cheaper, and does not run so much risk of being discovered in the extortions he practises. 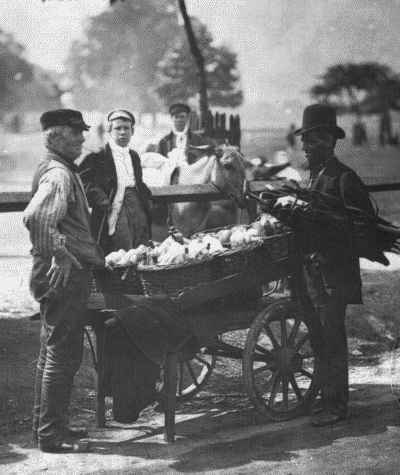 The most fruitful ground for the sale of ginger-beer, lemonade, and the other summer drinks which can be conveyed on a barrow, is, undoubtedly, the open-air resorts, where on holidays crowds of people seek health and amusement. At Clapham Common - where the accompanying photograph was taken - Hampstead, Greenwich, Battersea Park, &c., &c., on a broiling summer's day, there is a great demand for light, refreshing drinks, and more than £1 may be taken during one day by those who have a sufficient supply of ginger-beer with them, or some friend who can bring a fresh stock in the course of the afternoon. In ordinary times, however, twenty shillings a week net profit is considered a very fair reward for selling ginger-beer in the streets. Apart from the very hot days, and the pleasure-grounds around the metropolis, the best time and place for the sale is near the closed public-houses on a Sunday morning. The enormous number of persons who have spent their Saturday evening and wages in getting lamentably drunk, come out in the morning with their throats parched, and are glad of anything that will relieve the retributive thirst from which they suffer. Ginger-beer, under these circumstances, is particularly effective in restoring tone and mitigating the consequences of intemperance; and these are facts which readily account for the large sales effected on Sunday mornings. Even this phase of the business is, however, barely to be relied upon in the winter months; but, as it is an ill wind that blows nobody good, what the itinerary ginger-beer dealer loses, the street vendor of umbrellas gains. Thus we have before us two men who interpret the weather in a diametrically opposed sense. Every shower clouds the brow of the man whose income depends on the consumption of the summer drinks, while rain brings business and money to the seller of umbrellas. These latter are divided into various classes, and work according to the degree of capital they possess. The real "mush-fakers" are men who not only sell, but can mend and make umbrellas. Wandering from street to street, with a bundle of old umbrellas and a few necessary tools under their arm, they inquire for umbrellas to mend from house to house. When their services are accepted, they have two objects in view. First, having obtained an umbrella to mend, they prefer sitting out doing the work in the street, in front of the house. This attracts the attention of the neighbours, and the fact that they have been entrusted with work by the inhabitants of one house generally brings more custom from those who live next door. When the job is terminated, the "mush-faker" looks about him, as he enters the house, in quest of an umbrella which has passed the mending stage; and, in exchange for the same, offers to make a slight reduction in his charge. Thus he gradually obtains a stock of very old umbrellas, and by taking the good bits from one old "mushroom and adding it to an other, he is able to make, out of two broken and torn umbrellas, a tolerably stout and serviceable gingham. If he should fail to obtain sufficient stock in this manner, lots varying from a dozen to a gross of old broken umbrellas are sold in Petticoat Lane. These are brought to the Lane by the men who go about offering china in exchange for old coats, hats, umbrellas, &c., and are then sold wholesale in Petticoat Lane to the "mush-fakers," who have purchased the "commodity of the market" by paying the customary sixpence per week for the privilege of admission. In the evening, after the "mush-faker" has wandered through the suburbs in the manner I have described, he takes his stand on some special spot, probably near or in the midst of a Street market, and attempts to sell the second-hand umbrellas which he has resuscitated with the aid of considerable ingenuity and skill. Altogether, he is able to clear from eighteenpence to five shillings a day. But the "city men," as they are called, make far more. These latter frequent the City, may generally be found near the Royal Exchange, and can be distinguished by the green baize with which they envelope about two dozen umbrellas. They must possess some capital, at least £2, to buy so extensive a stock, and are consequently looked upon with some degree of envy by the ordinary "mush-faker." It is urged that they often known nothing of the trade; their success depends on their more elegant stock, and on the fact that their dress is sufficiently respectable for them to venture to stop a gentleman in the street and offer him an umbrella. On a very showery day these men have realized as much as £2 in a few hours; and though their umbrellas are not often worth the money paid for them, they are useful in cases of emergency. Another set of men, who pursue a different branch of the same business are known as "stool men," and they are more particularly distasteful to the real "mushfakers." The "stool men" have a still larger capital, and, what is more, possess "the gift of the gab." Selecting a corner or a by-street running into a crowded thorough-fare, they take their stand on a stool, and from that eminence commence an eloquent harangue, which culminates in the presentation of a number of umbrellas to the crowd which has gathered around. These men do not always admit that their umbrellas are second-hand. With new handles and fittings they make an old umbrella appear as if it had never been used. If the silk is very old and limp, it may be dipped in a weak solution of gum, and this will make it both stiff and glossy; so long, at least, as the umbrella is kept dry. But as the purport of an umbrella is precisely that of receiving the wet, it generally happens that this mode of deception is soon detected, and purchasers from "stool men" do not often renew their custom. The "stool men's" umbrellas, in fact, are made more for show than for wear; polished brass, nickel, or silver "fixings" are relied upon more than the quality of the silk or alpaca-show, as opposed to utility, carrying the day. The "stool men" themselves, even, very rarely know anything about umbrellas. They buy them wholesale from firms established in the neighbourhood of Bishopsgate or Petticoat Lane, and, when by accident any of them break, the "stool men " are often obliged to ask a "mush-faker to help them to mend their stock. This is a moment of triumph for the latter, for such incidents demonstrate that the trade should, if justice were done, be in their hands, instead of being shared by individuals whose only recommendation is due to the fact that they possess a little more money and a great deal more impudence. But, on the other hand, the "stool men, and also the "city men, are frequently obliged to change quarters; for when once they become known, custom leaves them, as neighbours relate to each other the deceptions they have experienced. The genuine "mush- faker," however-the man who is familiar with the nature of every " rib" and "stretcher" that expands and sustains his "mushrooms," and can make, or "fake," any part of an umbrella-is able to hold his ground, and re-appears, night after night, at the same market, gathers around him the support of regular customers, who can testify that they have never been deceived. Thus, I know of a "mush-faker" who has frequented the corner of Tottenham Court Road, near Oxford Street, for many years, and who always appears on this spot when he has anything to sell; but scores of stool men and "city men" have come and gone during the course of these years, and were never able to outlive the contumely which rewarded the impositions they practised on the poor who placed too much confidence in them.